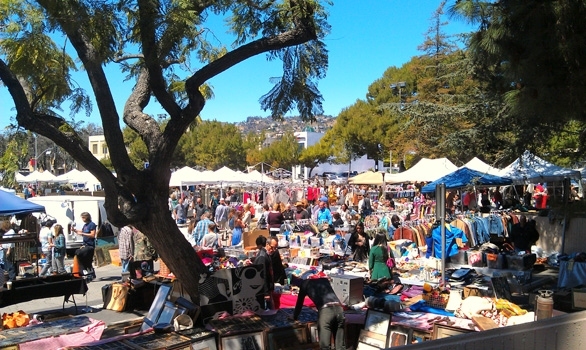 Spend your Sunday afternoon at one of Los Angeles’ most popular marketplaces - Melrose Trading Post! I’ll be playing tunes on the main stage near the Food Court area all afternoon while you shop… Swing through! Described as a cool, eclectic gem of a place to find treasures and rare goodies, the Melrose Trading Post is a great Sunday destination. You can expect to find something to make you say “wow” every single time you visit. Enjoy the food court in the beautifully landscaped upper quad. Relax to the live jazz band’s melodic vibes. Treat yourself to a different kind of day. Overseen by Greenway Arts Alliance and Friends of Fairfax, The Melrose Trading Post is widely regarded as the most successful ongoing fundraising event in the history of the Los Angeles Unified School District. Held every Sunday in the parking lot of Fairfax High School, the weekly antiques and collectibles market is home to nearly 200 vendors. It’s the perfect place to people watch and shop!